Multi Channel Systems, the market leader in MEA-technology, is proud to present the Multiwell-MEA-System. It is the perfect solution for medium to high throughput electrophysiology. 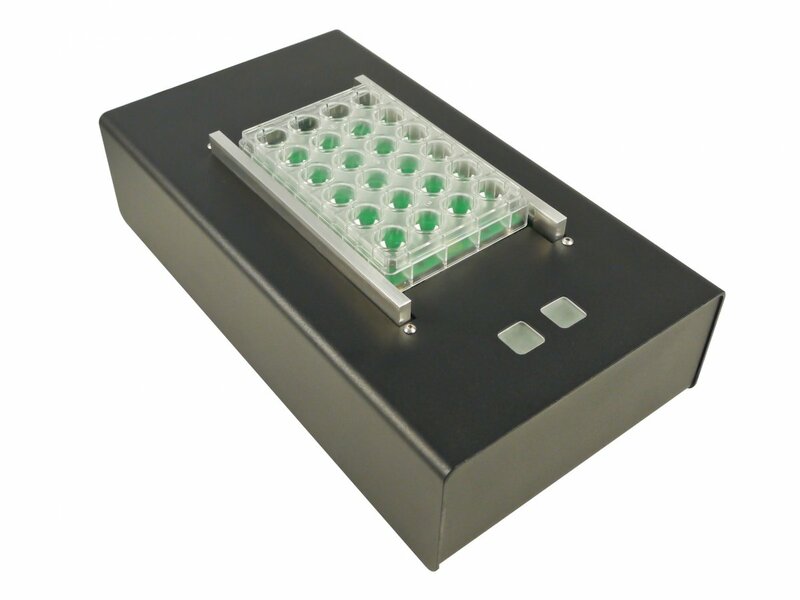 Featuring a 24-, 72- and 96-well plate format, it is especially suited for safety pharmacology and toxicity screenings. Being based on the MEA2100-technology, it includes high-quality, low-noise amplifiers, freely-programmable stimulators, and a digital signal processor for individual analyses. One big advantage of the Multiwell-MEA-System is the high sampling rate. Your data is sampled at up to 50 kHz per channel (simultaneously on all channels). Thus, the accuracy of your data is guaranteed, whether you record from cardiac or neuronal samples. The data is recorded and analyzed by the included software Multiwell-Screen. The Multiwell-MEA-System consists of 4 components: Well plates, headstage, interface board, and PC with software. Please click on the arrows on the right to learn more about the single components. Multi Channel Systems offers various kinds of SBS-compliant well plates. The 24-well plate has 12 electrodes per well, arranged in a 4×4 grid. The 72-well plate is based on a 96-well plate format, where the two outer rows are not active. In the inner 72 wells, you find 4 electrodes per well. The 96-well plate has 3 electrodes per well. In all well plates, there is an internal reference electrode in each well and each electrode can be selected for stimulation. The 24-well plate features opaque or transparent glass base material, so you can visually check your cells under a microscope. The electrodes can be as small as 30 µm for neuronal cells or 100 µm for cardiac samples. The electrodes are either of gold (100 µm) or – like all our standard MEA-electrodes – of Titanium Nitride (30 µm). You can go into higher throughput with the same electrode quality as with the low-impedance, high signal-to-noise ratio single-well MEAs. 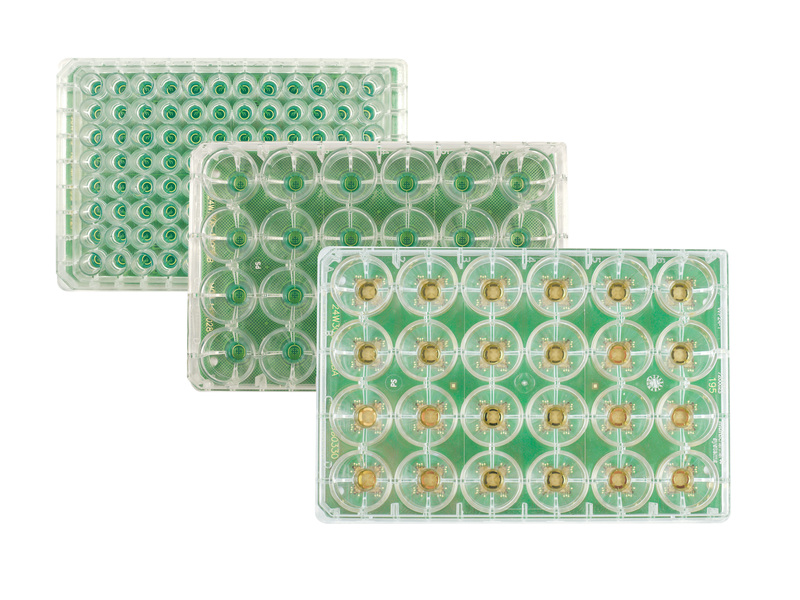 The 72- and 96-well plates are the perfect solution for high throughput screening. The electrodes are made of gold and make those well plate an economical solution for screening experiments. On the bottom of the well plates, you will see the contact pads, which connect to the contact pins of the headstage. The headstage is the core element of the system. It houses the well plate, amplifies and digitizes the signals and has an integrated stimulus generator. The brackets can be opened and closed either by pushing the buttons on the housing or with a single mouse click in the software. By closing the brackets, the contact pads of the well plate connect to the contact pins. Featuring 288 channels, the built-in amplifier makes sure that the recorded signals are amplified close to the signal source, thereby minimizing noise. The data is then sampled at 50 kHz/channel on all channels simultaneously, ensuring an excellent data quality. The headstage also provides an integrated stimulator for voltage driven stimulation. You can select any electrode for stimulation and design the signal shape via the included software Multiwell-Screen. For long-term recordings under stable conditions, the recording chamber can be covered with a lid, which has an inlet for CO2. The complete headstage can be placed in a dry incubator, if needed. Additionally, it has an integrated temperature controller which regulates the temperature of the heating plate right below the well plate. The interface board receives data from the headstage via a High Speed eSATA cable. In the interface board, you find a freely programmable digital signal processor, which can be used for real-time signal detection and feedback. Moreover, you find various analog and digital in- and outputs for synchronization with other instruments. The interface board supplies the connection to the computer via USB 3.0. The last component of the system is the computer with the included software package Multiwell-Screen. The software is designed specifically for the needs of screening experiments with the Multiwell-MEA-System. With only a few mouse clicks, you can set-up your experiment, including information on applied drugs and wash-in phases. 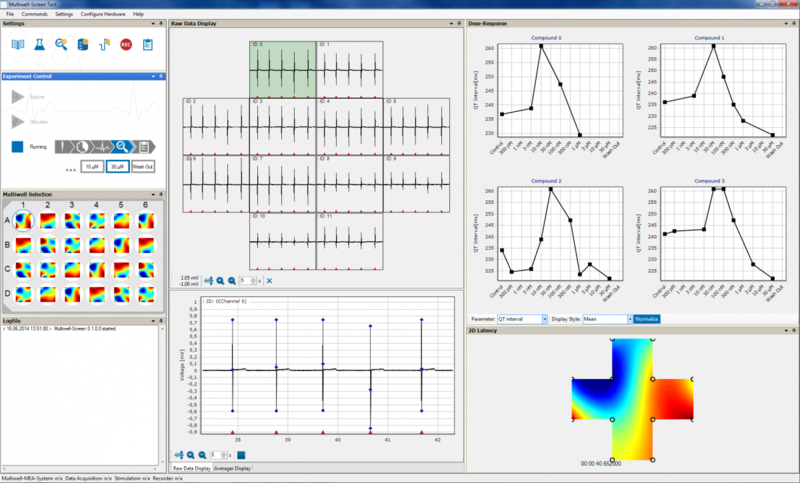 The software then guides you through your experiment and calculates dose-response curves automatically online, while you can select between different parameters (field potential duration, peak-to-peak amplitude, RR interval, spike count etc). You can display your data in real-time and filter it (high-pass, low-pass, Butterworth, Notch etc.). Moreover, you can detect spikes and also record digital events. The separate analysis software (Multiwell Analyzer), which is also included in the system, provides further tools for detailed offline analysis. Both tools are designed for repeated screening experiments, so saving your settings and experimental layout is quick and easy. As a policy at Multi Channel Systems, updates of the Multiwell Screen software package will be available online and free of charge, so you are always up-to-date with recent developments. Sampling rate of 50 kHz per channel ensures accurate data output. High-quality well plates with 12, 4 or 3 electrodes per well. One internal reference electrode per well. Each electrode is selectable for stimulation. Standard well plate format facilitates exchange between 24-, 72- and 96-well plates. Integrated stimulator (voltage driven stimulation), no other device necessary and the complete system is software controlled. Multiwell-Screen software specialized on screening experiments is included (updates available for free).